I don't usually go shopping, but when I do, I endeavor to either, A: Support a local artisan or maker by spending my money on handmade, high-quality pieces of clothing; or B: purchase used or vintage apparel. It's a blend of high and low that keeps me from supporting 'fast fashion' (I won't get into it here, but if you are interested in learning more about the political aspects of apparel, there is no shortage of depressing information out there about how environmentally taxing, damaging and wasteful this practice of consumerism is). If you are also interested in supporting sustainable fashion, I've put together a guide for how to support some wonderful shops and creators here in Kansas City! Check it out! - Hadley - I have loved designer Hadley Clark's exquisite garments for years. Hadley recycles beautiful materials made from natural fibers (such as silk kimonos and African indigo textiles) and creates the most beautiful and comfortable pieces, I feel like an actual High Priestess when I wear her clothes! It's also worth noting that Hadley is offering sewing lessons, workshops and textile tune-ups in her shop to educate and empower others to repair and tailor pieces they already own for their personal wardrobe. She's an incredible artist and her activism through apparel is badass! You should follow her instagram account if you don't already, you won't be sorry. Amazing dress by Hadley Clark. - Donnas Dress Shop - This shop is a jewel in Kansas City! I have found more treasures at Donna's than I can count, my favorite, one-of-a-kind, vintage pieces have all been found here! Donna and her staff are also super supportive of local artists and designers, Donna's Dress shop is always hosting pop-ups and creative events - it's a treat to visit her delightful shop! Aaaaand, if you are like me and are mostly a mole person who rarely leaves her hermit cave, do yourself a favor and follow Donna's awesome instagram account - no joke, the last three purchases I made there were because of her instagtam photos! 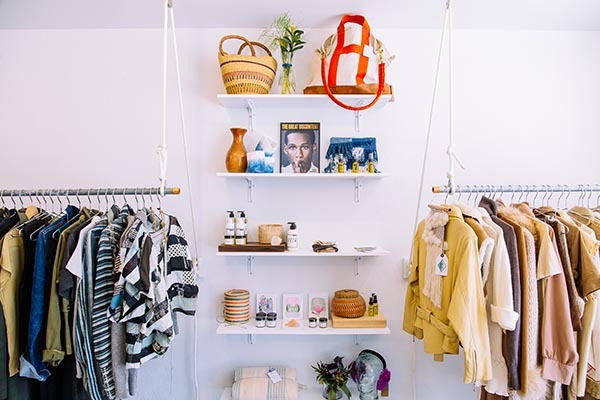 - We Are Sincerely Yours - Danielle Meister has created a charming boutique with hand-selected vintage items, one of a kind jewelry, TADEJ leather goods and beautiful Hadley Clark original pieces. Danielle's affinity for natural fibers, interesting textures and timeless design make her apparel offerings so special, and, she often collaborates with my other favorite vintage seller, Wunderhub Vintage! Danielle and Leslie both utilize instagram to reveal new finds and sales, so I highly recommend following them here and here. - Dear Society - Oh man do I love this shop. This lovely space offers beautiful vintage and new garments as well as home decor items. It's absolutely worth the visit, aaaand their instagram is full of PRETTY - check it out, here!